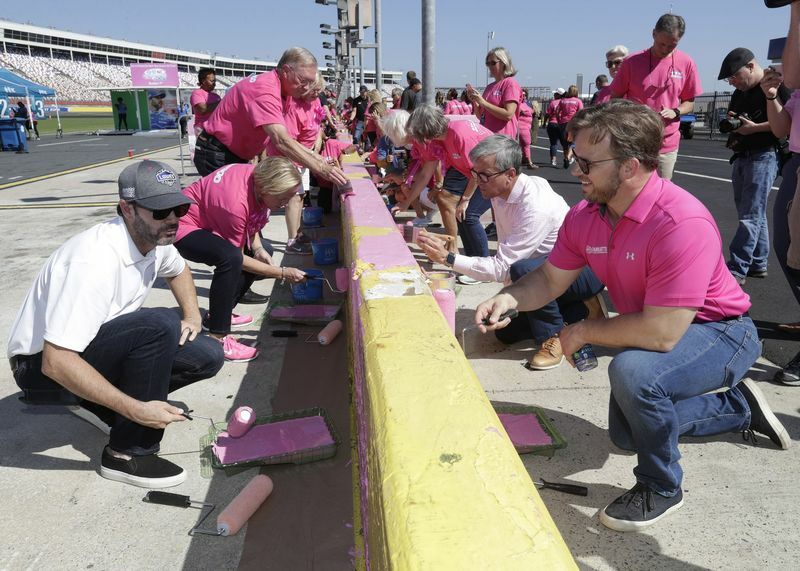 Seven-time NASCAR champion Jimmie Johnson joined breast cancer survivors, members of Blue Cross and Blue Shield of North Carolina and NASCAR XFINITY Series drivers to preview Breast Cancer Awareness Month by painting Charlotte Motor Speedway's pit wall pink on Wednesday. The fourth annual Paint Pit Wall Pink event honored those whose lives have been impacted by breast cancer and provided a fun morning for hundreds of survivors, who joined the drivers in using 150 gallons of paint, 200 brushes and 200 rollers to turn the 1,500-foot pit wall pink. Those in attendance also assembled more than 2,000 care packages for breast cancer patients and unveiled a pink Toyota Camry pace car that will lead the NASCAR XFINITY Series field in the Drive for the Cure 300 presented by Blue Cross Blue Shield of North Carolina on Oct. 7. Blue Cross and Blue Shield of North Carolina presented a $60,000 check to Susan G. Komen as part of the event. "I have friends who have had breast cancer and I'm a father of two daughters, so it's important to spread the word about early detection," said Johnson, a Blue Cross and Blue Shield brand ambassador for more than a decade. "To be a part of something so positive is a great thing." Blue Cross and Blue Shield of North Carolina brought its expansive "Live Fearless" display to the speedway to promote the urgent need for preventative healthcare, early detection and finding a cure for breast cancer. "Blue Cross tells us we should 'Live Fearless,' and that means we can feel a sense of security in our lives - not worrying that something like cancer will destroy all our plans," said Carole Wilson, who was diagnosed with breast cancer in 2015 and is the wife of Blue Cross NC President and CEO Brad Wilson. "I learned to live fearless, knowing I had a safety net that will allow me to concentrate my efforts on beating cancer." In addition to Johnson, breast cancer survivors, Blue Cross and Blue Shield of North Carolina dignitaries and NASCAR broadcaster Hermie Sadler - who emceed the event - NASCAR XFINITY Series drivers Justin Allgaier, Bubba Wallace, Daniel Hemric, Ray Black Jr., Jeremy Clements, Spencer Gallagher, Cole Custer, Michael Annett and Blake Koch painted the speedway's pit wall pink. "To come out here and raise awareness for (breast cancer) means a lot," Wallace said. "This is my third year coming and I've seen some familiar faces. It's good to see them and see how they're doing." Tickets are still available to the Oct. 7 Drive for the Cure 300 presented by Blue Cross Blue Shield of North Carolina. Kids 13 and under get in FREE with a ticketed adult. As a salute to Dale Earnhardt Jr.'s final Charlotte race as a full-time driver, adult tickets to the Bank of America 500 are available as a two-pack for $88 and include a Dale Jr. bobblehead while supplies last. 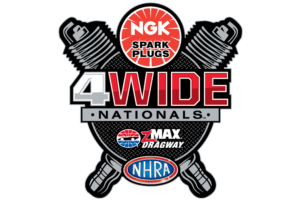 All adult tickets are good for admission to the Oct. 7 Brad Paisley concert presented by Wrangler and Nationwide at zMAX Dragway. For tickets, camping packages and upgrades, fans can call the ticket office at 1-800-455-FANS (3267) or shop online at www.charlottemotorspeedway.com.